I selected this woody-based perennial for this months featured plant to give it some much-needed publicity. This perennial is under-utilized in our local gardens. They can grow to 3 to 4 ft tall, although usually, you find hybrids that just reach 2 ft. The ones we have at the nursery from a local grower range in the coral pink red spectrum of flower color and are of the smaller types. 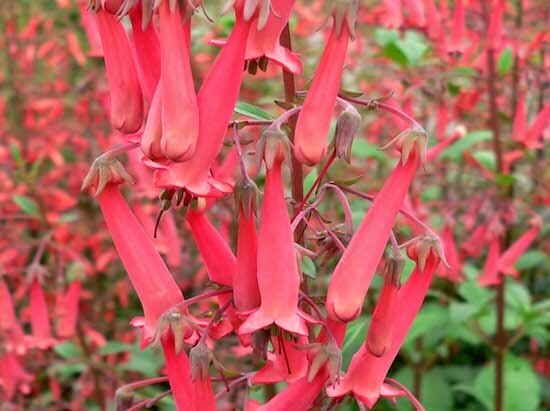 They are related to snapdragons and the drooping tubular flowers and its South African heritage have provided the common name Cape Fuchsia. Although not considered to be drought resistant they will grow in our sun or light shade. 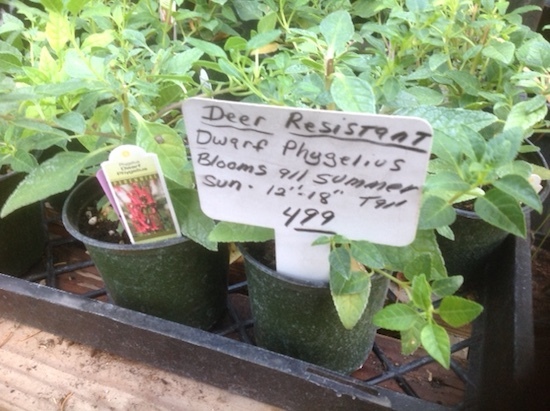 They are deer resistant and very long blooming making them an ideal candidate for a container or in the ground. Remove spent flowers to keep them blooming through the summer and a little food would not hurt either. They deserve a place in your garden. Thank you all for coming out to our Customer Appreciation Day. It was our best attended one ever! Congratulations to the winners of our $50 gift certificates- Eve Herdell, Marci, and Michelle Claypool. The winner of the wind chime was (forgive the spelling but it was the best I could decipher) Therea LeGare. I think all of you were winners that day, going home with great plants and such, at sale prices, and the weather was perfect. Onion sets and garlic have shipped so should be here by the time this newsletter goes out. 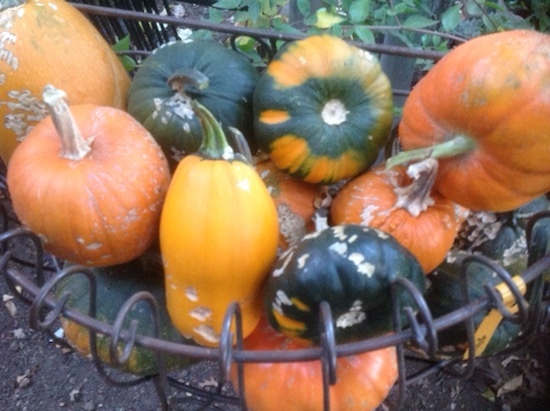 The bad news is there were crop failures on the organic crops, so we will be getting regularly grown ones. The potatoes are still in the ground and will not ship till the first of November. The invoice for flower bulbs came in the mail so I know they are in route also. We hope to have them by the weekend. We only ordered a few types of bearded iris and they are here. A fresh batch of little cactus came last week. The Eremophila maculata ‘Valentine’ is beginning to bloom. This is in our Arizona Collection. Fast grower, heat tolerant and winter blooming to 4ft x 4ft. Hardy to 15 degrees. Also in the Arizona Collection are the Blackfoot Daisy and the Angelita Daisy. They have been blooming for months now along with the Mexican Oregano. Lots of great looking yuccas left too. The dwarf Floral Showers Snapdragon 6 packs have been arriving especially nice and the pansy/viola rack is full of great selections that survive the winter for your cool-season color in a sunnier location. The primroses have been suffering a little with this late heat wave, but they are still one of the better selections for winter color in a shadier spot. The shrub daisies are starting to bloom again for winter and you can plant the ornamental cabbage in sun or bright shade. Just not where the deer can get them. 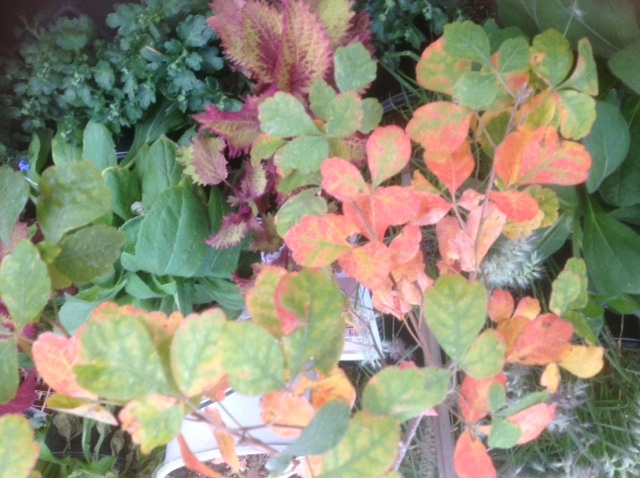 Of course in my mind the best color this time of year is not from flowers but from fall foliage. As the trees and shrubs go into dormancy the green chlorophyll dissipates, often leaving glorious color in the foliage before it falls. One of my Chinese Pistache trees is starting to turn and these trees are one of the best choices for fall color in our climate. Other good selections for colorful fall trees here, with shades of reds, oranges, and golds, are Crape Myrtle, Raywood Ash, Ornamental Pear, Red Maple, Red Oak, Ginkgo, Washington Thorn, Persimmons, Sweet Gum and Zelkova. Don’t limit your palette to just trees. Many deciduous shrubs put on a show too. 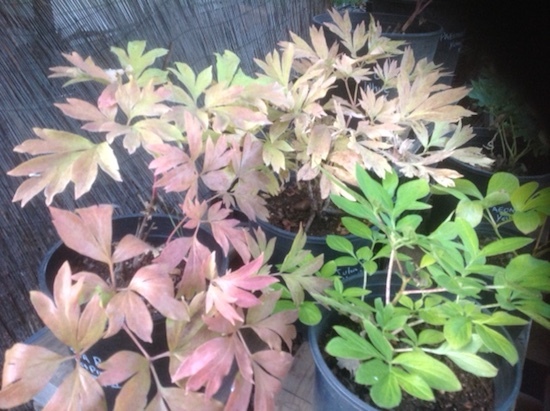 Among my favorites are spireas, lilacs, dogwoods, barberries, viburnums, oakleaf hydrangeas, Boston ivy, and burning bush. Grapes and a lot of the fruit trees turn rich colors too and they will continue to be on special in October as the 2019 trees are already ordered and we need to sell this year’s selection. Forget the notion that these beauties are high maintenance due to leaf cleanup. Evergreens lose leaves and needles over a much longer period and in my mind are more clean up trouble than deciduous plants. Besides, deciduous hardwood trees and shrubs are more fire resistant. Speaking of fire resistant, FEMA Outreach is planning on having a table here at the nursery Sept 28, 29 and 30th. Lots of info on fire safe landscaping if you did not pick up any at the Master Gardeners Help Desk that was here during Customer Appreciation Day. The contact person was going to e-mail me more info on it but I probably missed it in the mountains of political e-mails I am receiving these days. I am hoping that there is an interest with all the re-planting going on this fall now that a lot of you are FINALLY back in your new home. Please stop in this week-end if you are in the process of landscaping. One tip I picked up with her on the phone was that after our recent fires, they believe the 5 ft around the house is the most critical. However, experience has proved that all bets are off in a firestorm. Here is to hoping for no more major fires for the rest of the year. This weekend might even bring some precipitation. Fall chores include pulling up the summer garden, replenishing the soil and planting the winter garden with great greens, peas, broccolis, etc. Or plant fava beans and other cover crops in your vegetable beds if winter veggies are not your thing. We have re-stocked the Pacific Coast Seed wildflower selection. Look for the new packs of bee, butterfly and hummer blends. Feed your spring-blooming shrubs and trees, including fruit, with E. B. Stone 0-10-10 for better flower production and disease resistance. (Fall is the time to do this. Spring is too late.) October is the prime month (along with April), to start a lawn from seed and to replenish your existing lawn by overseeding with some fresh new starts. Cool nights and warm, not hot, days are the trick. The holidays are around the corner and just a reminder we will have living and cut trees again this year along with wreaths and decorative tabletop potted plants.